XXIX Mod Review - Top Features, Ratings, Pros & Cons! Home → Mods → Mech Mods → XXIX Mod Review – Top Features, Ratings, Pros & Cons! 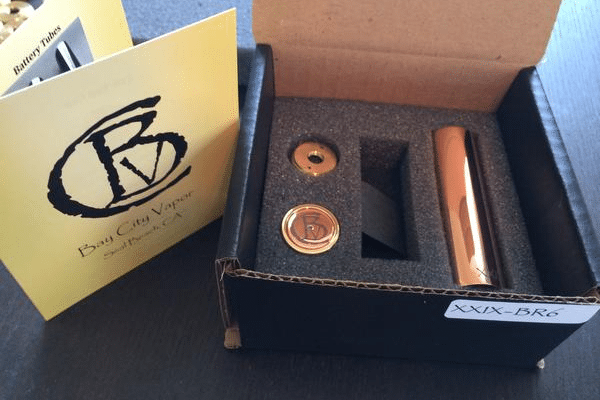 XXIX Mod Review – Top Features, Ratings, Pros & Cons! Bay City Vapor is the cradle of this mechanical mod. The company may be relatively new to the vaping space but make no mistake about their potential to design and bring mechanical mods of superior quality. Their journey started with variable voltage units and then the mods came in later. XXIX mechanical mod has been touted as a hard hitting copper mod and it’s not hard to see why. Right from its new and unique pin-less contact design to the full copper construction to the advanced magnetic switch, everything that’s been packed into this mod puts it ahead of the pack. If you’ve just stepped into the vaping market to look out for a compact mechanical mod with proven reliable performance, look no further than the this mod. Discover more about it by sticking with this XXIX Mod review to the end. It’s clear that Bay City Vapor did create this unit with durability in mind seeing that it’s made out of pure copper. All of its entire outer body actually comprises a full copper construction. How it works impresses too only that you’ll have to clean it often, probably after a day of use or a couple of sessions. And much as veterans will find it easy and probably enjoyable using this mod, newbies are cautioned against using it for various that you’ll see later in this XXIX copper mod review. On battery usage, the mod really does a great job at avoiding voltage wastage and maintaining the production even as the battery discharges. It won’t cost a lot to own this mod and looking at all the innovations and uniqueness packed into it, it’s definitely a solid unit for that price. Very interesting to note is that each of the components that makes up this unit was crafted with care and skill and with the aim of refining its performance. Right from its single tube body to the hybrid 510 connection to the four-part switch, each of these components plays a special role in making this unit unique and innovative. Add on the two powerful neodymium magnets that not only contribute to the safety of the unit but also give a short and smooth throw and you’ll have a sum of eight parts that work together to make this unit remarkable. Much effort was put to ensure durability was a permanent quality of this mechanical mod. Even though some of the inner parts are non-copper, its body is crafted out of solid pure copper. A full copper construction means the unit can endure hard falls and other tough punishments. If there’s a word that best describes the size of this mod, then it’s impressive. Compared to other mods out there, the size of the 18650 is ridiculously small and even when you buy it, it’s easy to mistake it for an incorrect item. If you placed it to next to a bottle of 30ml capacity, you won’t notice much of a difference between the two in terms of height. Thanks to the hybrid 510 connection, no voltage is actually going to be lost in between the atomizer and the battery. And as the battery discharges, you will hardly notice any drop in vapor production. One of the reasons why this mod is not ideal for beginners is that it needs someone who is knowledgeable and understands how to take care of Lithium type batteries. Naturally, these batteries are quite sensitive and likely to explode or burst into flames if one mishandles them. Unlike an old 510 connection which often comprises a pin that does the work of transmitting the battery’s current to the atomizer, this mod uses a hybrid 510 connection in which the atomizer makes direct contact with the battery, meaning there’s going to be very little voltage lost. This adds to its efficiency as the perfect unit for cloud chasing. If there’s something you are going to admire the most about this mod, it’s the bottom switch. It looks simple yet it’s the most effective part you will find on this mech. It screws straight into the firing pin which you can adjust to let the switch sit where you prefer it. But keeping it in the same plane as the bottom is always recommended. A Delrin ring that also doubles up as an insulator helps to keep the battery against wobbling or rattling. Just as we mentioned earlier in our XXIX mod clone review, this mod’s body is made out of solid copper that measures 22mm in diameter. It has been machined in a nice way and finished with a lovely and smooth threading. And because of this copper design, firing this unit happens immediately and it also boasts of great connectivity. That’s a great thing to have with your rebuildable atomizer. Everything we’ve put out in our XXIX Mod review suggests that the XXIX mechanical mod is a powerful mode and much as it will need you to look after it daily or after a couple of sessions, it still does its job like a pro when appropriate care is taken in its use. Innovation and uniqueness took center stage in its creation as seen in the inclusion of a hybrid 510 connection and a recessed bottom switch. Overall, it packs into its tiny space premium features that give it an edge over its competitors. Newbies may not find this mod friendly and so it’s advisable to only try it out after you’ve matured further in this vaping space. So if you are in love with it and would wish to own this mod, head over to Bay City Vapor to make your purchase.